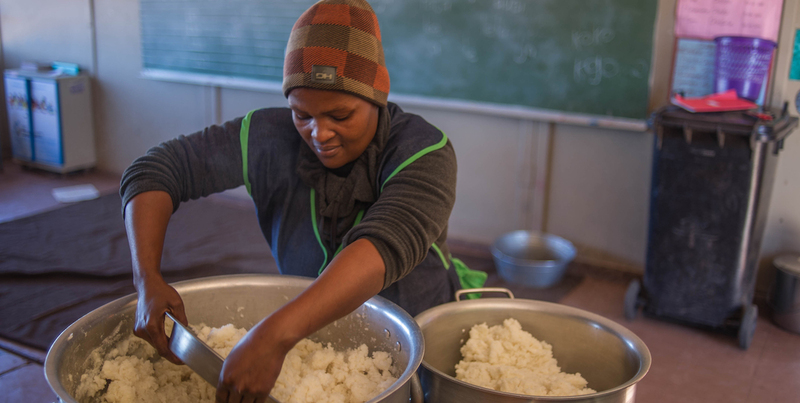 Reflecting on a recent visit to a rural school in the Northern Cape, ActionAid South Africa director, Fatima Shabodien, says school feeding schemes are set up to fail if they don’t have proper kitchens. Joyce Stone (35) hurriedly shuts the lid to a bubbling pot and quickly shields her eyes from the stinging sand that swirls all around us. We are standing just outside the door of a makeshift kitchen adjacent to Reitemogetse Primary School in Gasehubane Village, Kuruman, Northern Cape. This unventilated, windowless, low-roofed, 1.5-metre squared corrugated iron shack is the schoolâ€™s kitchen, where hot meals are prepared for over 100 learners every day as part of the schoolâ€™s feeding scheme. Introduced in 2002, South Africaâ€™s National School Nutrition Programme aims to support better quality educational outcomes by â€œenhancing children’s active learning capacityâ€. â€œThe windy days are the worst,â€ Stone says, looking down with a deep frown at the food now peppered with dust. She goes on to lament how the rainy season makes cooking just as difficult and how her tin kitchen turns into an oven during the scorching summer months. Stone is mother to her own three children attending Reitemogetse Primary. Her cooking and cleaning job at the school doesnâ€™t pay much and is difficult work under unforgiving circumstances. From Monday to Friday, she starts cooking at 7am, in order to have the hot meals ready by 10am. For many of these children, this is the only meal they eat for the day. Judging from a quick glance at the weekly menu taped to the inside of the shack, the standard meal is a spoon of pap and meatless bean stew. At some of the neighbouring schools this meal is occasionally supplemented with fresh vegetables from the school food garden, if one has been established. After the meal is served and the dirty plates are returned to the â€˜kitchenâ€™, Stone begins the arduous task of carrying buckets of water from the outside tap back to the shack to clean up. Despite the daily grind of ensuring over 100 children are fed a hot meal five days a week, under trying circumstances, she remains committed to it, â€œBecause without the food these learners would not be able to concentrate on learning,â€ she explains, adding that most come from poor homes with little to no food. As we stand outside talking, two grade seven girls are quietly darting around us carrying stacks of tin plates from the tin kitchen into a nearby classroom. Inside this classroom, we find Margaret Jonathan, who tells us with beaming pride that she has been a teacher for 32 years. Jonathan teaches the combined class for grades two and three. As a result of resource constraints many rural schools, like this one, are forced to combine learners from different grades into a single class. The principal of this school, Mr Tauyane, shares Stoneâ€™s frustration, and says he is at his witsâ€™ end. The school is in a quandary: it desperately needs this feeding scheme to make education possible but their budget doesnâ€™t allow for the construction of a proper kitchen. Without a proper kitchen the school is at risk of losing the feeding scheme due to health and safety concerns. The local municipal health inspector has already visited the school declaring the kitchen facility unfit for food preparation. The Presidency reported that â€œby 2012, almost nine million learners had received meals under this national feeding schemeâ€. 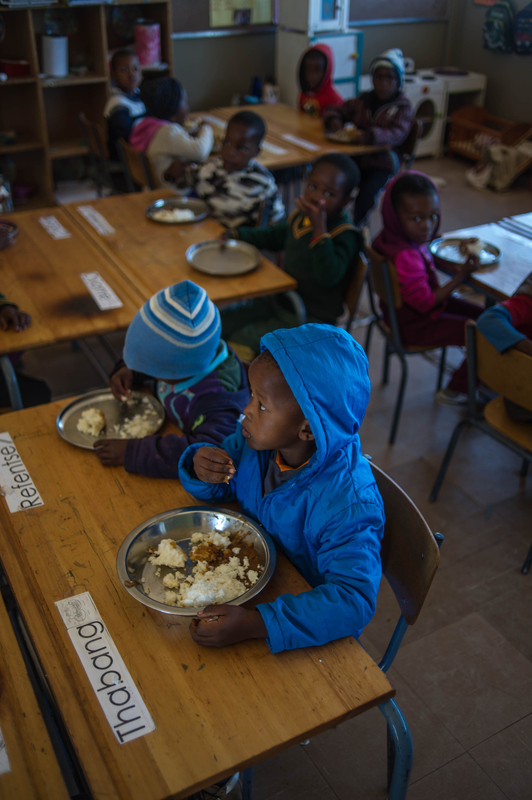 This year, the annual budget for the scheme has reached R6.4 billion, with an estimated cost of between R2.42 and R3.19 to feed a single learner per day. While government budgets for the meal ingredients, it makes no allocation for the kitchen infrastructure. Since most rural schools are unable to meet even the minimum norms and standards for public school infrastructure, itâ€™s virtually impossible for them to establish kitchens as per the standards required for hygienic food preparation facilities. It goes without saying that the construction of school kitchen facilities for the purposes of enabling the school feeding scheme should be paid for by the government. In desperation, Tauyane says the school has already approached many of the mining houses operating in Kuruman. The mainstay of the local economy is mining, mostly manganese, iron ore, tiger’s eye and crocidolite. Despite the reported profitability of these mining companies and their legal responsibility to uplift mining communities, the schoolâ€™s call for help has fallen on deaf ears. At ActionAid South Africa we do what we can to support schools by establishing food gardens and providing training in climate-resilient farming. We also help as much as possible to prevent these lifesaving feeding schemes from being shut down, but the scale of need is significant and there are only so many schools that NGOs can directly assist. If we have agreed as a country to provide at least one hot meal per day to learners in poor schools because we recognised the impossibility of teaching a hungry child, then we really should see commitment and follow through from duty bearers. With the StatsSA Poverty Trends report still fresh in our minds, painting a horrifying picture of our countryâ€™s present and future, which are especially disastrous for South African children and young women, government must urgently make provision for better education infrastructure to ensure we do not lose another generation to poverty and unemployment. Fatima Shabodien is the director at ActionAid South Africa. Follow ActionAid South Africa (AASA) on Facebook, Twitter and Instagram. AASA is a member of ActionAid International, a global movement of people working together to further human rights and eradicate poverty. comrades it seems as if a feasible plan is not being drafted or given due consideration. A plan which could be modified as more resources or better use of resources come about. You should petition government agency with a feasible plan down to itemized costs of goods plus services thereto total circumstance of your school students feeding program will be transparent with a responsible government either having to provide you with adequate funds or provide you with material resources plus required supplemental funds. For a government possessing resources government of South Africa possess it is inexcusable plus incompetence to greatest degree by either government or school officials where adequate meals are not available to school children. I willing to bet interest my investments earn this week that no government official will go without adequate meal or meal at all unless that official so desire thus, why should they force upon school children to do without adequate meal. What happen to Buntu people we liked for their just ways plus goodness. We need to find them plus put them in charge of government. Very much sincere, Henry Price Jr. aka Obediah Buntu IL-Khan aka Kankan aka Gue.